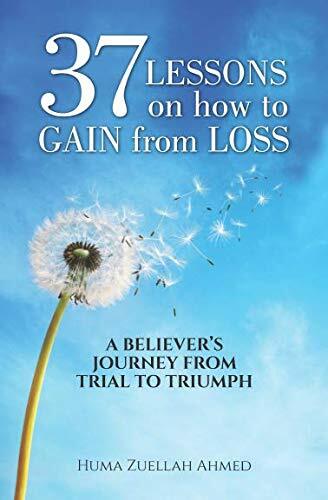 “37 Lessons on How to Gain from Loss” by Huma Zuellah Ahmed is a book about personal transformation. It is also the author’s journey from trial and loss to living triumphant and free from the pain that held her back. Using her personal experiences, Ahmed takes the reader through her most devasting trial, the illness and subsequent passing of her mother, and explains the steps she took to find her way to freedom. “37 Lessons on How to Gain from Loss” is unique in that it is part self-help, part spiritual and part memoir. As the author takes the reader through the journey of her mother’s illness, it reads like memoir passages, and at the end of these passages Ahmed lists her lesson and the steps to take to achieve the goal of the lesson, incorporating many self-help and spiritual concepts. There is a lot of information in this book, so it’s not one to read through quickly. I found myself taking notes all along the way, noting the pages and topics I wanted to go back to and revisit in greater detail. 37 different lessons may seem daunting at first, but a lot of the steps blend together in a quite natural procession and some are lessons you may have experienced yourself throughout your own journey. I was comforted to read passages that felt familiar, as if the author knew of my particular struggles. In fact, the author, who describes herself as a human being, Muslim and Spiritual Self-Discovery and Mindset Coach and Trainer, has a wealth of experience to share that many readers will connect with and feel a “part of” on so many levels. Much of the writing resonated with me. The entire book is laced with wisdom such as those following. Mindfulness is one of the strong themes I identified with most. I’ll list but a few for the purposes of this review. The author’s journey was driven by her deep spiritual beliefs and that is included in the text as well. She often quotes the Quran as that is what fuels her passions. Without getting into my own beliefs too heavily, I found the messages inspiring and not so different from what I grew up learning. I highly recommend “37 Lessons on How to Gain from Loss” by Huma Zuellah Ahmed. An open mind and a willingness to do some work, as the author suggests in the beginning of the book, are all that is needed to start your own journey towards freedom from pain.